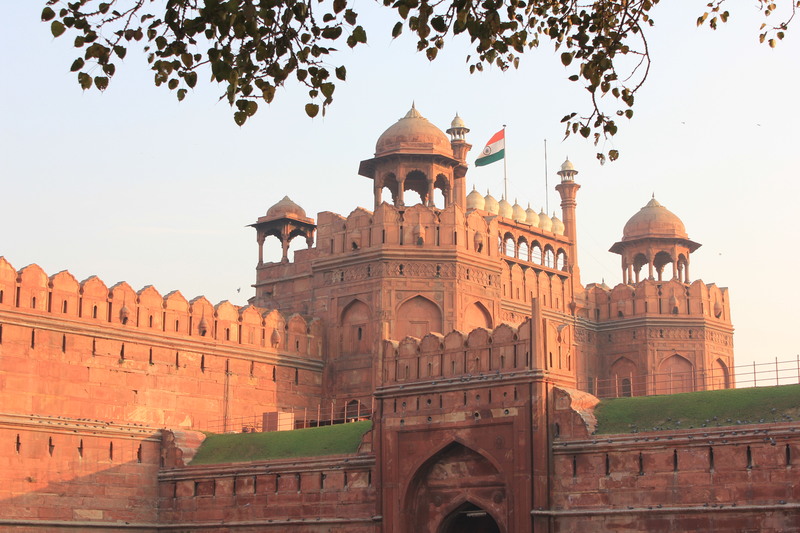 The Red Fort in Delhi is one of the most beautiful and well-designed forts in the world. 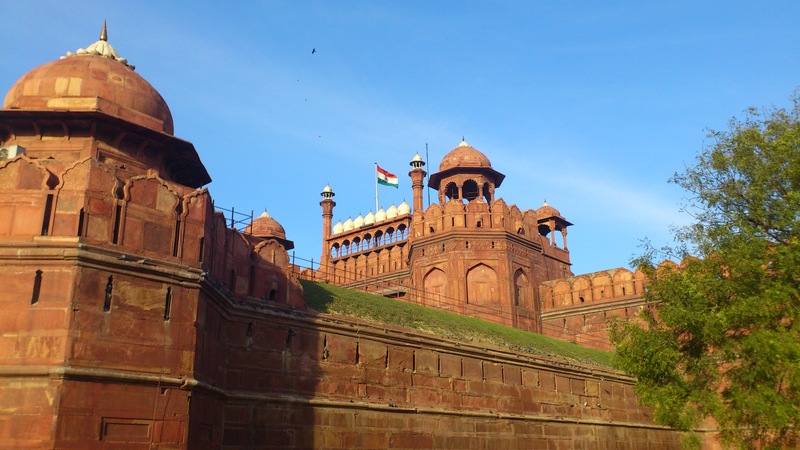 The largest monument in Delhi, it has become a symbol of independent India since the first Prime Minister, Jawaharlal Nehru, unfurled the tricolor on the Lahori Gate, at midnight on the 14th of August 1947. Since then, every incumbent Prime Minister hoists the National flag atop the Lahori Gate on the 15th of August every year, and addresses the nation. Its splendor, or what is left of it, attracts millions of visitors every year, and is among the most visited monuments in India. In 2007, it was declared a UNESCO World Heritage Site. 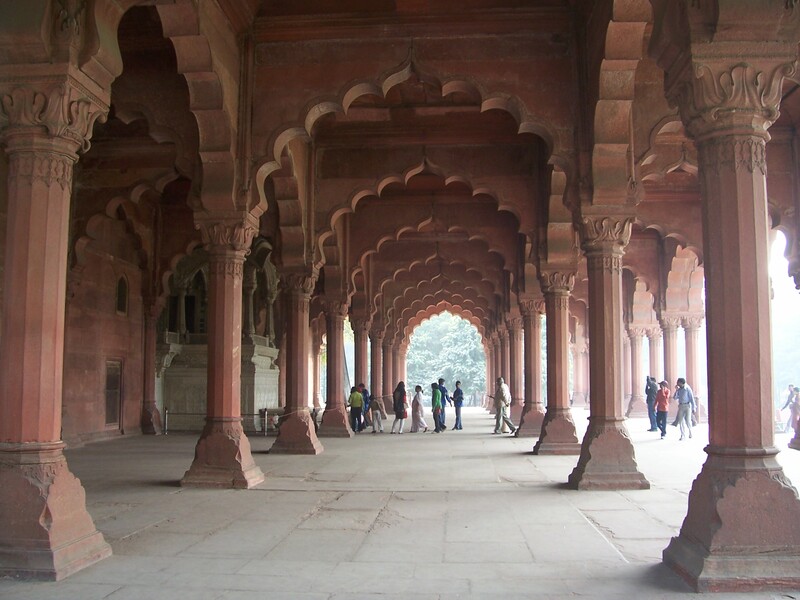 In 1638, the fifth Mogul Emperor, Shah Jahan, decided to shift the capital from Agra to Delhi. 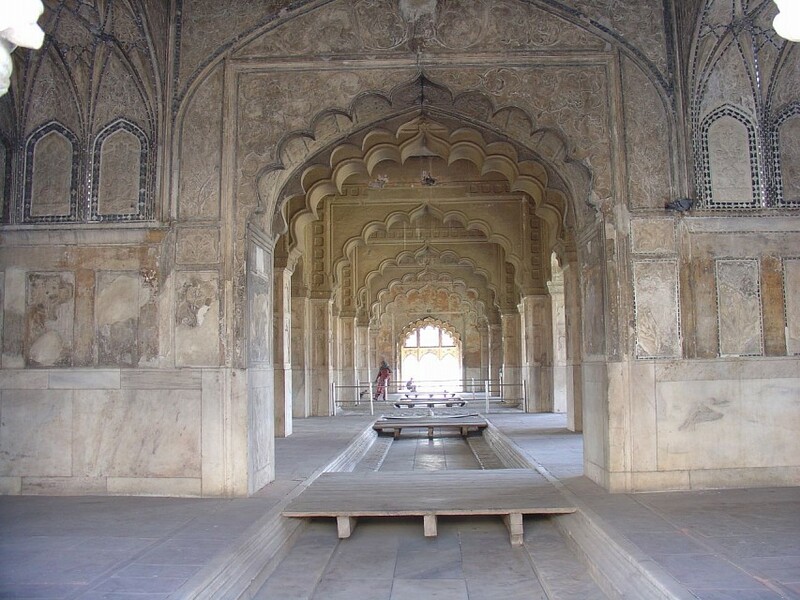 He commissioned the fort the same year, and recruited Ustad Ahmed Lahauri and Ustad Hamid as architects. Its construction began on the 29th April, 1639, and was completed in 1648. 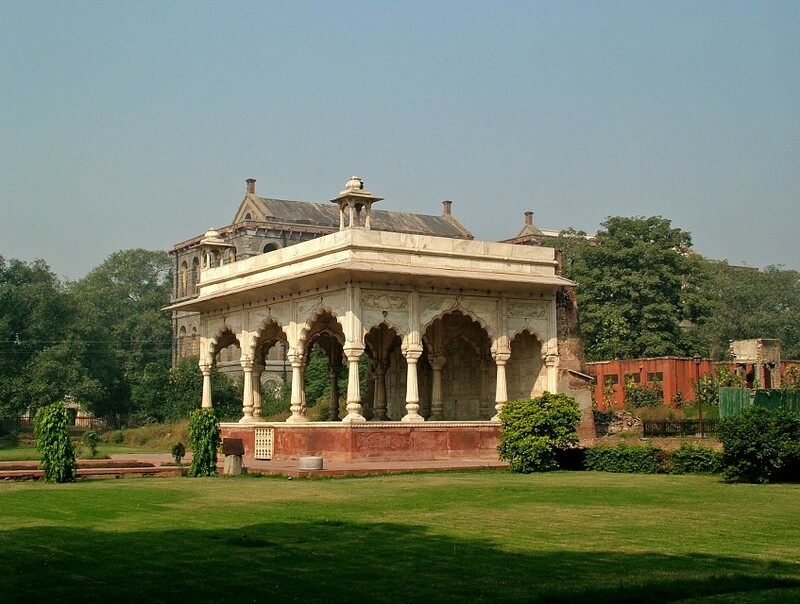 The fort, with the royal palace in it, was the stronghold of the capital city of Shahjahanabad, and was referred to as the Quilla-i-Mubarak (the Blessed Fort). The Salimgarh Fort, built a century earlier, was also included within the fortifications. 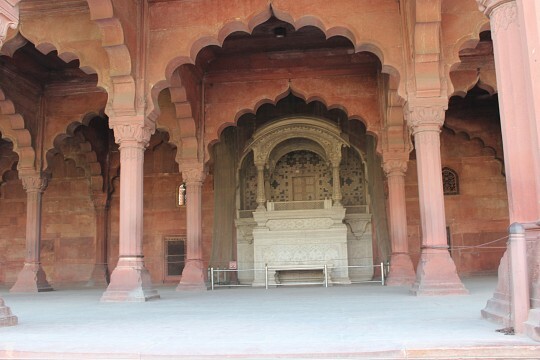 A pious Muslim, Shah Jahan was later placed under house arrest by his son Aurangzeb in the Agra fort. Aurangzeb had the Pearl Mosque built within the fort. He also built a 34 feet barbican at the Lahori Gate to the west. Under arrest at the time, Shah Jahan was displeased with the addition and wrote to his son, “You have made a bride out of the fort and put a veil on her face.” The post Aurangzeb era, which lasted for up to 49 years till 1707, saw a marked decline in the control of the Mogul Emperors over their empire. Administration was slack and the fiscal structure deteriorated. Aurangzeb left the fort in 1682 on the Deccan campaign and spent the last 26 years of his life on the trail. It was only after Jalandhar Shah assumed the throne in 1712, that the Red Fort had an Emperor, after a gap of thirty years. Shah was murdered by his nephew Farukhsiyar. The new ruler of the Mogul Empire did not have a head for administration. His brothers attacked Delhi with the help of the Marathas and dethroned Farukhsiyar in 1719. With exceedingly weaker rulers ascending the throne at the Red Fort, Nader Shah of Persia, invaded and ransacked the Red Fort in 1739, then ruled by Muhammad Shah. In the booty that he took away, was the prized Peacock Throne, commissioned by Shah Jahan.The throne is now in Iran. In 1752, the Moguls signed a treaty with the Marathas, making them the protectors of the throne. 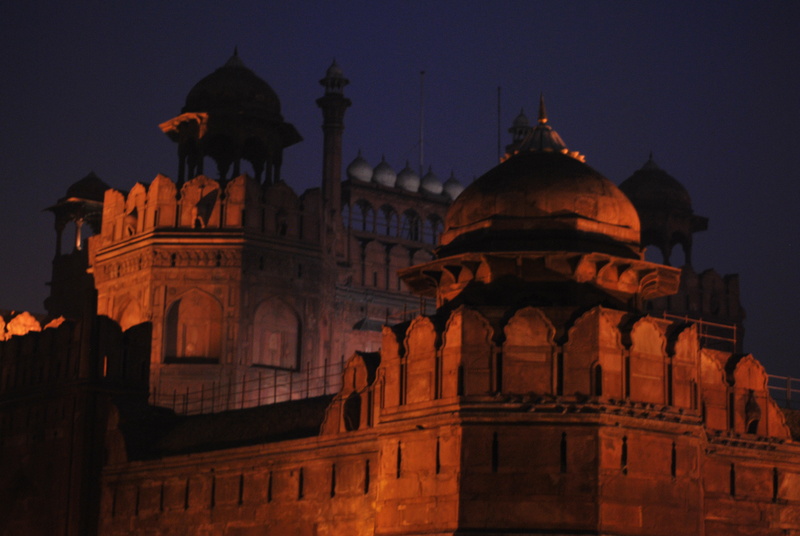 As the cost of protecting Delhi, the Marathas removed the silver ceiling of the Diwan-i-Khas in the Red Fort and melted it. The British East India company secured Delhi after defeating the Maratha forces in the Battle of Delhi in 1803, captured Bahadur Shah II and executed him. The British then plundered the valuables from the palaces and buildings in the fort. Harems, servant quarters, and gardens were razed, and soldiers' barracks built in their place. Other than the marble structures on the east of the fort and the walls and the towers, most of the other buildings were destroyed. The British monarchs visited India for the India Durbar in 1911. There was an attempt to restore several damaged buildings for their visit. 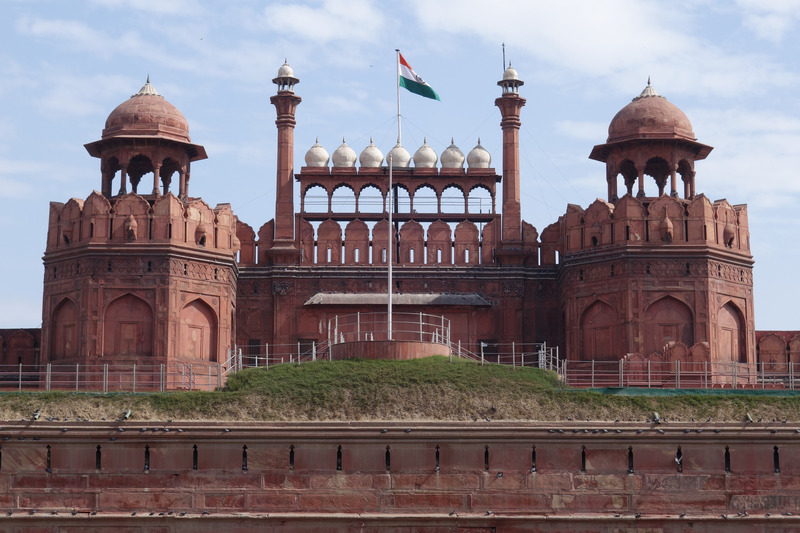 The Red Fort hosted the infamous trials of several Indian National Army officers, who were court-martialed in November and December of 1945. The sprawling fort occupies an area of 1,041,400 square meters (255 acres) and is enclosed by a 1.5 miles (1.5 miles) of red sandstone rubble fencing. The fence is in the shape of an irregular octagon in order to accommodate the older Salimgarh Fort. Located on the banks of the Yamuna River, the defensive walls of the fort reach a height of 59 feet on the riverside and 108 feet on the city side. The walls are interspersed with turrets and bastions at regular intervals. Two major gates allow entrance for visitors into the fort. The Lahori Gate to the west and the Delhi Gate to the south were common access points to the public, while the smaller Khizrabad Gate (Water Gate) on the river side was used exclusively by the Emperor, particularly for his boat rides on the Yamuna. 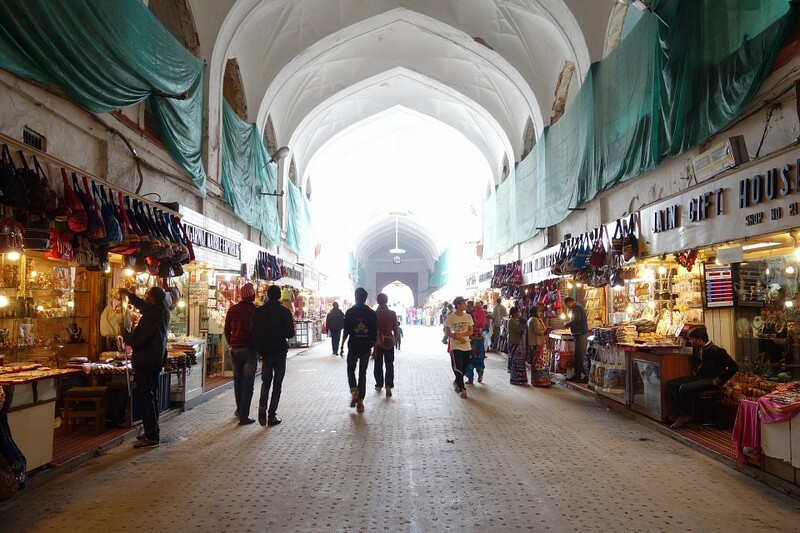 Beyond the vaulted arcade of the Lahori Gate is the Chatta Chowk, a place where jewelry, silks, and trinkets were sold to the royals and the nobles. Outside the Chatta Chow was the outer court which was destroyed by the British after the rebellion of 1857. The court was 17,600 square meters or 4.3 acres in regards to area, with side arcades and a tank. The Naubat Khana or the Drum House is on the eastern side of the court. Music, appropriate for the time of the day was played there continuously. The Naubat Khana leads to the inner main court, the Diwan-i-Aam which is 19,000 square meters in area and has the Diwan-i-Aam (Hall for the Public) on the other side. the Emperor would listen to the grievances of his subjects here and dispense justice. The façade has nine arched doorways and the inside is decorated with white chunam (lime) and gold paint. At the end of the central hall is an alcove on which sits the royal throne, and below was a canopy under which the Prime Minister would be seated on a dais. Behind the throne, the wall has some stunning panels done in the style of pietra dura . Austin de Bordeaux, from Florence, created one of the panels with Orpheus using his lute. On the eastern side of the fort were six palaces constructed mostly of marble. A canal, the Nahar-i-Bihist (the Stream of Paradise) carried water through the row of pavilions from a marble basin which had a fountain made of ivory in it. On the southernmost edge, are the two pavilions that served as the women’s quarters or the “zenanas”. The Mumtaz Mahal (Jewel of the Palace) was named after the Emperor’s favorite queen, and Rang Mahal was so called because its interior is painted with bright colors, unlike the other buildings. North of the Diwan-i-Aam is the Diwan-i-Khas (Hall of Selected Audience). Built of white marble inlaid with jewels, the Emperor used to conduct court, seated on the Peacock Throne in the hall. 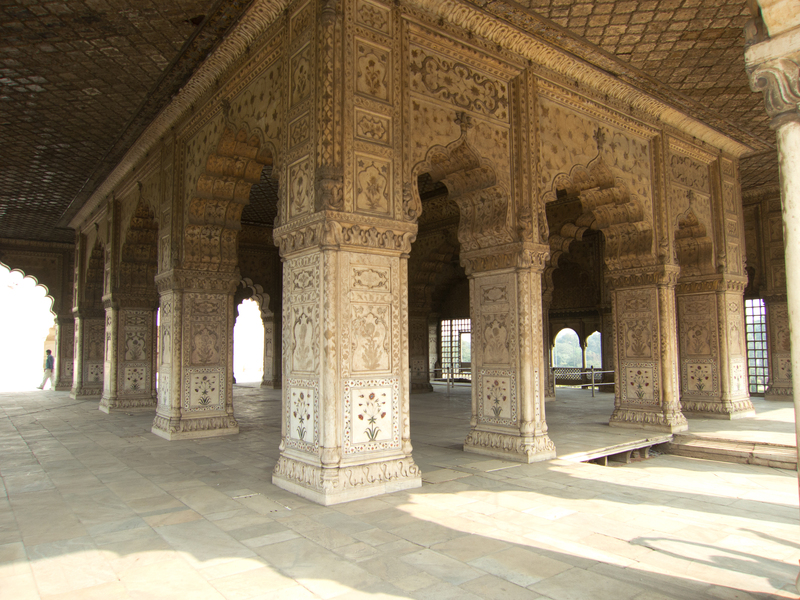 The silver ceiling was replaced with wood once the Marathas appropriated the silver as the cost of defending Delhi. The inscription “If Heaven can be on the face of the earth, it is this, it is this, it is this.” appears on the outside of either side of the hall. 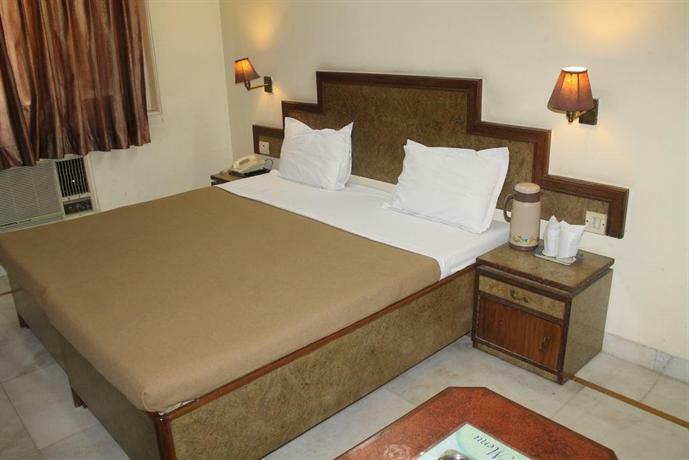 The prayer hall, Tasib-Khana, has three spacious rooms with a Khabagh (sleeping room) behind. On the eastern side of the Khabagh is the tower, called the Muthammam Burj from where the Emperor would address his subjects each morning. A balcony, added later by Akbar Shah II served as a platform for King George V and Queen Mary to greet the people of Delhi in 1911. The Hammam was a bath house supplied with warm and cold water, and was built with marble inlaid with colored stones. 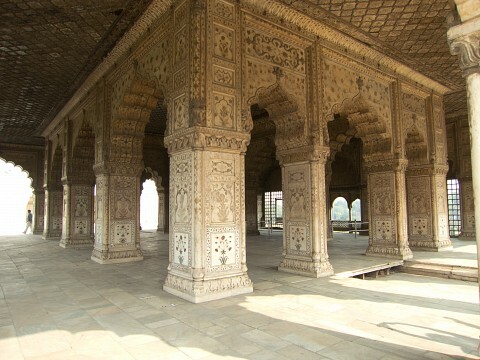 The Moti Masjid or the Pearl Mosque was a later addition by Emperor Aurangzeb. A three domed mosque, it is built of white marble. Other buildings of interest are the Hira Mahal (Palace of Diamonds), built by Bahadur Shah II, the Shah Burj (The Emperor’s Tower), and the Hayat Baksh Bagh (Life Bestowing Garden) in the north east section of the fort. 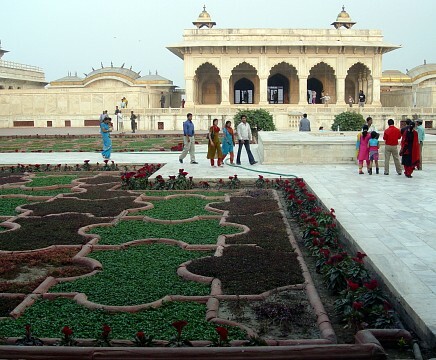 The Shahi Burj (Princes’ Tower) and other small gardens were destroyed by the British forces after the rebellion of 1857 to build barracks for the soldiers. Shah Jahan is regarded as the greatest builder of the Mogul Emperors. 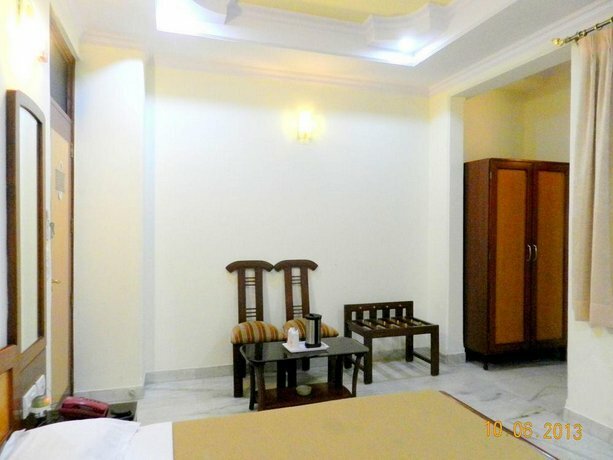 Among the other fabulous constructions he has left behind are a largely renovated Agra Fort, the Wazir Khan Mosque, the Shalimar Gardens, parts of the Lahore Fort, the Jama Masjid, and the incomparable Taj Mahal. The Shah Jahan Mosque in Thatta, Pakistan, has 93 domes and is a UNESCO World heritage Site. The fort is one of the most securely guarded sites in Delhi after a terrorist attack on the 22nd of December in 2000. The fort itself is well policed, and the Delhi Police and paramilitary forces keep watch on the places around the fort. During big celebrations, the air space around the fort is classified as a no-fly zone. 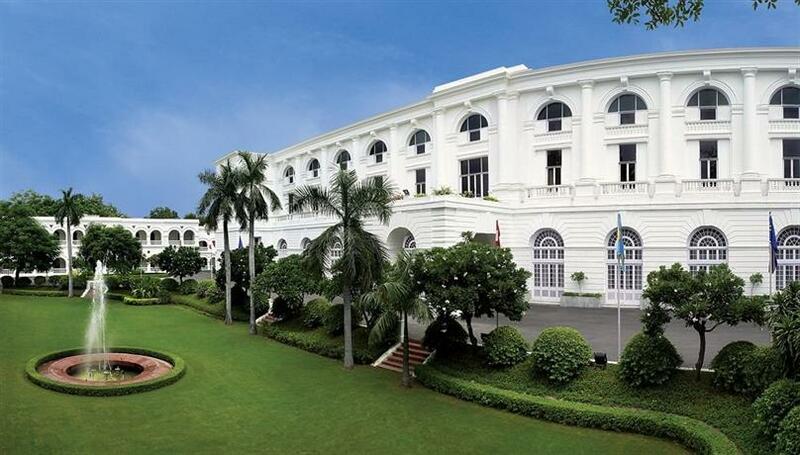 Delhi is a veritable delight for the sightseer. Sri Digamber Jain Lal Mandir, Vijay Ghat; Chandni Chowk, Shanti Van; Fatehpur MosqueJama Masjid, are all within a kilometer of the Red Fort. India Gate, Rashtrapathi Bhavan; (Presidential Palace), Humayun’s Tomb; Qutub Minar, Purana Quilla; Laksmi Narayan Mandir, Akshardam; Lotus Temple, and Raj Ghat that are places which enlighten a visitor about India’s history and heritage. 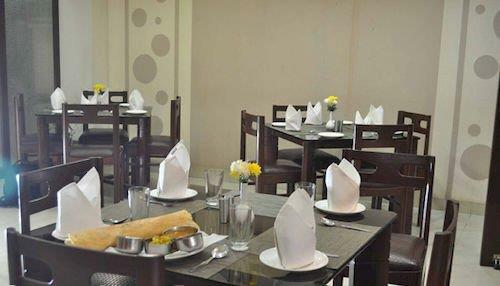 Restaurants and hotels abound and there is a wide choice of cuisines from Mughlai to South Indian. 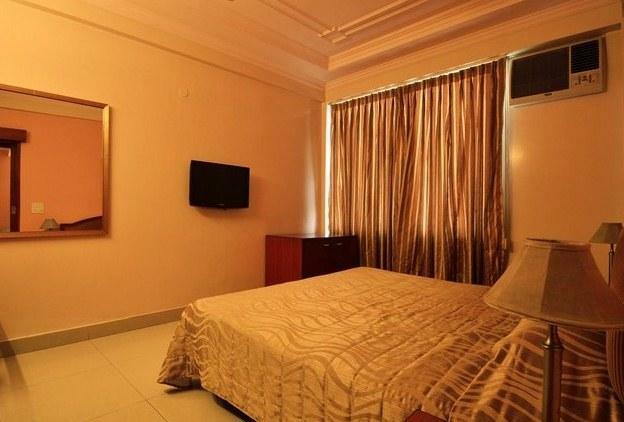 Chandini Chowk Metro station is the closest for train commuters, at one kilometer from the Red Fort. All the major cities of the neighboring states are well connected to Delhi by train and by bus. The international airport is 14 miles from the fort, while the domestic airport is at 3.1 miles. Indian nationals and those from the neighboring countries are charged ₨ 10 ($0.16) for entry into the fort, while foreigners are charged ₨ 250 ($4.00) ( $ 5.00 USD ). The fort is open to the public on all days of the week except on Mondays. 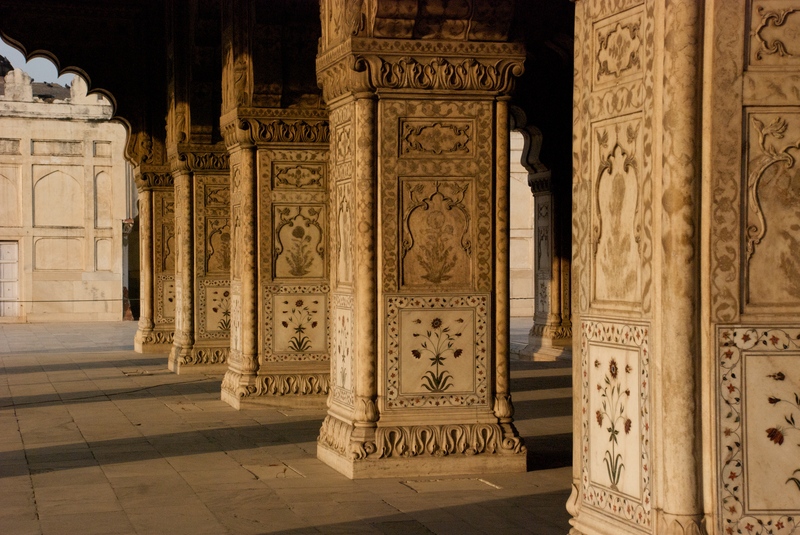 Between 7.30 and 8.30 pm, a light show highlighting the Moghul period is staged every day.